The Directors of The Department of Environment and Climate Change Canada (ECCC), the Office National de la Chasse et de la Faune Sauvage of the French Republic (ONCFS) and the United States Fish and Wildlife Service of the United States of America (USFWS), have signed an agreement to share information sharing and collaborate to promote sustainable populations of shorebirds in the Western Atlantic Flyway. 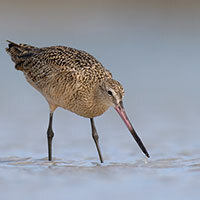 Specifically, the three agencies intend to: 1) share information in a timely manner, including data, reports and other documents about shorebird ecology that will improve their understanding of shorebirds and the management and conservation of their populations in the countries and territories within the Western Atlantic Flyway, as appropriate; 2) share information on and experience with shorebird habitat protection and management, as appropriate; 3) collaborate on specific scientific surveys and shorebird monitoring programs, and harvest assessment methods; 4) provide cooperative support for data analysis and reporting when feasible; and 5) keep each other informed about changes in shorebirds hunting regulations in their respective countries. The agreement will last for five years with possibility for extensions.